I used (winter 2018) to be able to capture a JSON response using either Chrome or Firefox developer tools. Now for the long ones I need (>> 1 MB) Chrome doesn't work, and Firefox truncates at 1 megabyte. This was using the developer tools. Short ones work on Firefox. There was a recent response on "firebug" saying it was fixed in Firefox, but no. This was a response from familytreedna.com of a big JSON file used to construct a tree. The web page works ... but it takes a long time to download the data file (11 megabytes!) Is this a bug or "feature" in the developer tools. This bug already reported on https://bugzilla.mozilla.org and fixed in Firefox 61. So update your browser to v61 (if you didn't already) and feel free to report the issue on bugzilla if it's still exists. Firefox dev tools network inspector still truncates responses to 1MB by default. 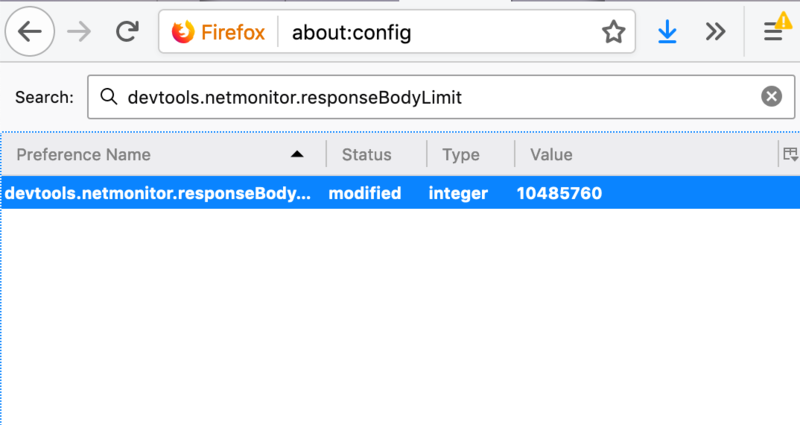 You can change or disable the limit by navigating to about:config and changing devtools.netmonitor.responseBodyLimit. To disable the limit, set it to 0. Not the answer you're looking for? Browse other questions tagged google-chrome-devtools firefox-developer-tools or ask your own question. How to debug ajax response? It is possible using only firefox to take a screenshot of Firefox Developer Tools?